Although a usually very careful and dependable local historian stated that this cemetery was in the N.E. corner of the S.W. ¼ of Sec. 19 of Bethlehem township, we entirely fail to find any confirmation of that statement, and do not believe that it is true. Testimony of the “oldest of the old-timers” of this locality and township seems agreed that the cemetery was, and that what remains of it still is, in the NORTHEAST CORNER of the NORTHEAST QUARTER of the SOUTHEAST QUARTER of SECTION 19, of T. 28 N., R. 2 E., of Second Indiana P.M., and in western BETHLEHEM TOWNSHIP of northern CASS COUNTY (in northcentral Indiana ). This is ¼ mile east of the location given by the historian. 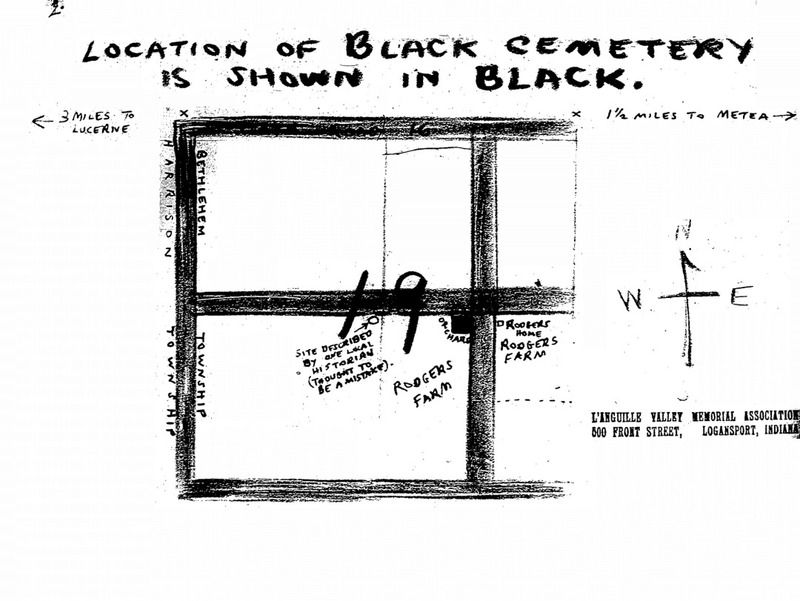 Unlike spot mentioned by historian, cemetery is on land entered and patented by Gavin Black. The historian says cemetery is in an orchard, which we find to be true, and on what long was known as the Bassler Farm. But all this agrees with OUR location and seemingly not at all with the historian’s legal description which we therefore assume is simply the result of a much repeated typographical error. (Comment: The “Seven Mile Tavern” on the historic old Michigan Road , which passes a mile and a quarter or more farther east of cemetery, was run during the pre-Civil War period by a Mr. Wilson Boothe; who is thought to be the “ W. Boothe ” here mentioned. Note: Research discloses that David Studebaker (See p.1) served as ADMINISTRATOR of Gavin Black’s estate (1867-1782). At least three other graves are understood to have been here (in addition to the ones we have listed); and these are thought to have been neighbors of this pioneerday family of Blacks. During the decade beginning 1860, the Blacks are said all to have been removed (to Metea Baptist Cemetery ). Originally a beautiful walnut-grove, this no longer identifiable little cemetery is now in an orchard on what long was known as the BASSLER Farm, and is today the farm of Sarah F. (Bassler) Rodgers. On this farm a number of years ago occurred a very terrible tragedy, a lady (who subsequently was ---------declared insane) having suddenly murdered four members of the Brassler household, an event which greatly interfered with the normal course of events in this locality, and perhaps at least partly accounts for the state of total neglect (and almost total oblivion) into which this (even then already long-abandoned) little pioneer-day cemetery has descended. (The ownership of the very land itself was long in question; for, with so many lives snuffed out in a few seconds or moments, the rapid change of ownership became extraordinarily problematic, everything hingeing upon the precise order in which the slain persons had died, a thing which was, under the circumstances, probably rather difficult to determine, and took a considerable time for the Court to determine, because various problems of inheritance and estate-settlement (involving the various deceased and other persons) had to be solved. Newspaper reporters from many large cities and thousands of other persons tramped through the little old cemetery or its vicinity shortly after the tragedy; and the farmhouse itself is said to have been later left vacant for a number of years. All vestiges of the old cemetery’s original fence have long since entirely disappeared. …Tradition says that a very great many years ago, the fallen little old slabs were carefully BURIED on the graves which they previously had marked; but the Association hardly feels justified at attempting to spade (or dig) up this entire orchard in quest of these supposedly buried little old slabs. Mr. Gavin Black himself is understood to have died in or about 1866, and there seems to be some slight difference of opinion as to whether he too was (originally) buried in this little cemetery on his own farm, (and later disinterred and removed to Metea Baptist Cemetery), or whether he was originally buried in the Metea Baptist Cemetery) and his family’s graves later vacated, and removed to that last-mentioned cemetery, in order that these members of his family who had preceded him in death might lie at his side, instead of in the little family-cemetery on his old farm which, after his death, was to pass into other hands than those of his own family). FIELDWORK FOR THIS PRESENT REPORT WAS BY Wilbur E. Zieg, Rural Route 1, Lucerne , Indiana , in May 1941, who is a member of L’ANGUILLE VALLEY MEMORIAL ASSOCIATION. This report is by R.B. Whittsett, Jr., Secretary, L’A.V.M.A., Logansport , Indiana. This report was transcribed by Harriet Stair for the Cass County INGenWeb Project, December 2006.